Attachments on the Samsung Galaxy Tab work pretty much the same in both the Gmail and Email apps. The key is the paperclip icon, not only for receiving attachments, but for sending them as well. The Galaxy Tab lets you view or save most e-mail attachments, depending on what’s attached. 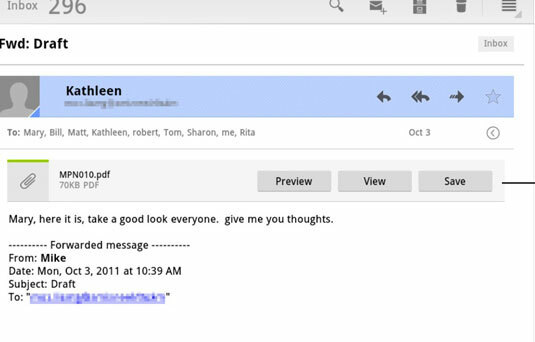 You can also send attachments, though it’s more of a computer activity, not something that’s completely useful on a mobile device; the Tab isn’t really designed for creating or manipulating information. Email messages with attachments are flagged in the inbox with the paperclip icon, which seems to be the standard I-have-an-attachment icon for most e-mail programs. When you open one of these messages, you may see the attachment right away, specifically if it’s a picture. When you don’t see the attachment right away, you may see one of the attachment options. Touch the Preview button to witness the attachment on your Tab. Touch the View button to download and see the attachment. Touch the Save button to save the attachment without viewing it. Sometimes, pictures included in an e-mail message aren’t displayed. You find the Show Pictures button in the message, which you can touch to display the pictures. What happens after you touch the Preview or View button depends on the type of attachment. Sometimes you see a list of apps from which you can choose one to open the attachment. Many Microsoft Office documents are opened by the Quickoffice app. Some attachments cannot be opened. In these cases, use a computer to fetch the message and attempt to open the attachment. Or, you can reply to the message and inform the sender that you cannot open the attachment on your Galaxy Tab. The most common thing to send from the Galaxy Tab as an e-mail attachment is a picture of video. You’re not limited to only pictures, though. You can attach documents you’ve previously saved on the Tab, music, even random files if you’re so bold. Gallery: Pluck a picture of video from the Tab’s Gallery app. Quickoffice: Choose a document that you’ve saved on your Galaxy Tab. Select music track: Choose music saved on your Galaxy Tab. Other items: If you’ve installed another photo manager or a file manager, it also appears on the list. The number of items you see depends on what’s installed on the Galaxy Tab. Also the variety is different between the Gmail and Email apps. You’ll use the program you’ve chosen to locate the specific file or media tidbit you plan on sending. That item is attached to the outgoing message. To select more than one attachment, touch the paperclip icon again. It’s also possible to send an attachment by using the various Share commands and buttons located in apps throughout the Galaxy Tab. After choosing the Share command, select Gmail or Email as the app to use for sharing whatever it is you want to share.